New Zealand prides itself on its “clean green, 100 % pure” image and uses this to the benefit of the tourism industry. Unfortunately, in recent years, this maxim is severely misrepresenting the state of the environment in respect to freshwater ecosystems. Coupled with anthropogenic pollution and heavy metal contamination of many of New Zealand’s most significant waterways, the freshwater environment has been threatened further by the widespread appearance of Didymosphenia geminata, popularly termed Didymo. 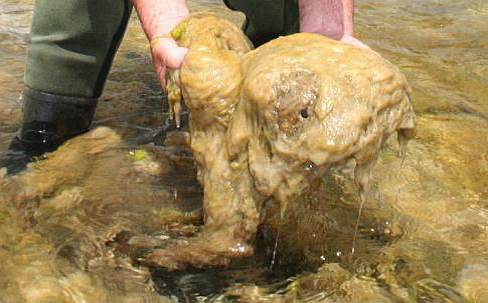 Since 2005, “rock snot” has manifested itself throughout the South Island across 140 rivers1, appearing first in the Waiau River in Southland. D. geminata is a particular species of diatom found almost exclusively in the Northern Hemisphere until its arrival in New Zealand. Blooms of Didymo (extensive benthic layers of algae) are primarily triggered by key environmental stimuli and once formed, blanket the stream bed with a thick layer of sludge. Chief among these factors is the concentration of the element, Phosphorus (P) in the given ecosystem. Waterways with limited P levels are most at risk of developing D. geminata blooms2. The reduced supply of Phosphorus shares a positive correlation with the growth rate and thus rate of cell division amongst the diatoms, prompting a bloom3. Since the initial outbreak and spread of Didymo, the New Zealand public and environmental sector have come to realise that its presence has severe negative implications for all involved affiliates. Ranging from effects on recreational use of rivers such as angling, where surveyed respondents suggested that the value of their angling experience fell by $44 per visit due to the incidence of D. geminata4, to the commercial scale, where the presence of D. geminata threatens the structural integrity of multi-million-dollar hydrological power schemes5, it is quite apparent how big of an issue it proves to be for New Zealand society. The environmentally significant consequences are arguably more severe. D. geminata presence in freshwater ecosystems is shown to reduce the scale and productivity of aquatic food webs6, disrupt reduction- oxidation processes and alter pH levels7, ultimately causing perturbations in the abiotic conditions that invertebrate communities rely on to survive, subsequently having on flow-on effects for their respective populations sizes and growth rates8. This permeates through all the levels of the food chain, as invertebrates form a key staple of many predators’ diets, such as Rainbow and Brown Trout9. As such, the New Zealand government alongside the Department of Conservation (D.O.C) and Fish and Game have prioritised a “Check, Clean, Dry” biosecurity initiative to limit the further spread of D. geminata (click the link for a brief introduction to this process). This approach however, seems far more aligned with a damage limitation strategy but unfortunately for New Zealand, that’s where the situation is at. Whilst, the study of D. Geminata is still in its infancy and thus much of the hypotheses about future predictions are yet to be validated, the warning signs are very apparent. New Zealand’s freshwater ecosystems form a vital piece of the nation’s identity and thus, the spread of D. geminata should be one of the foremost issues in the minds of those in charge of New Zealand’s environmental future. 1 Kilroy, C., & Unwin, M. (2011). The arrival and spread of the bloom-forming, freshwater diatom, Didymosphenia geminata, in New Zealand. Aquatic invasions, 6(3), 249-262. 4 Beville, S. T., Kerr, G. N., & Hughey, K. F. (2012). Valuing impacts of the invasive alga Didymosphenia geminata on recreational angling. Ecological Economics, 82, 1-10. 5 Worrell, Richard. (2010). Dam Didymo. E.nz Magazine: The Magazine of Technical Enterprise, 11(4), 44-46. 6 Gillis, C. A., & Chalifour, M. (2010). Changes in the macrobenthic community structure following the introduction of the invasive algae Didymosphenia geminata in the Matapedia River (Québec, Canada). Hydrobiologia, 647(1), 63-70. 7 Reid, B., & Torres, R. (2014). Didymosphenia geminata invasion in South America: Ecosystem impacts and potential biogeochemical state change in Patagonian rivers. Acta oecologica, 54, 101-109. 8 James, D. A., Ranney, S. H., Chipps, S. R., & Spindler, B. D. (2010). Invertebrate composition and abundance associated with Didymosphenia geminata in a montane stream. Journal of Freshwater ecology, 25(2), 235-241. 9 Beville, S. T., Kerr, G. N., & Hughey, K. F. (2012). Valuing impacts of the invasive alga Didymosphenia geminata on recreational angling. Ecological Economics, 82, 1-10.